Each of us can empower others to make small changes that can have a big impact on their lives. Be the influence for those you care about, with help from One Degree: Shift the Influence Simulation. By practicing talking with our virtual humans, Donna and Jordan, you’ll learn how to navigate these conversations in real life. Hi, I’m Donna! I’m dealing with a lot these days, and I use alcohol to cope with stress. Practice talking with me before you talk with someone that you care about. Read more. Donna is a single mom who is going through a difficult divorce. She’s always been outgoing, extroverted, and successful at work, but lately she’s been drinking more to cope with the stress. Donna has been having two or three drinks each night at home, even on nights when she’s not at happy hour with her friends. She’s also started relying on alcohol to help her sleep. Donna’s friends and family have noticed that she is not herself. In this simulation, you’ll play the role of Phil, a relative who is concerned about Donna’s increased drinking as a coping mechanism for her stressful life. You’ll practice how to bring up your concerns without upsetting her, and help her brainstorm alternative ways to cope with stress. Hi, I’m Jordan! I enjoy partying, but my drinking and smoking weed have been getting in the way of keeping my job. Practice talking with me before you talk with someone that you care about. Read more. Jordan has a bright future and has been thinking about going to college. He’s been saving money by working in restaurants while living with his parents. Jordan used to enjoy being outdoors and camping on the weekends, but recently, he’s been spending most of his time and savings on partying with his friends, smoking pot and drinking. He is routinely stoned and it’s been affecting his relationships, including with his boss. In this simulation, you’ll play the role of Phil, a co-worker who is concerned about Jordan. You’ll practice how to bring up your concerns without upsetting him, and brainstorm ways to balance his partying with his goal of saving money and going to college. If you’re a healthcare provider, click here to view our provider portal. Playing the role of a relative, practice how to motivate Donna to cut down on her drinking and brainstorm other ways to cope with stress. Playing the role of a co-worker, practice how to motivate Jordan to cut down on partying and focus on his goal of saving money and going to college. Talking with those around us about alcohol and other substances can help prevent injuries, improve family and work life, and promote overall well-being. One Degree: Shift the Influence empowers each of us to be the influence and help change the lives of those we care about. 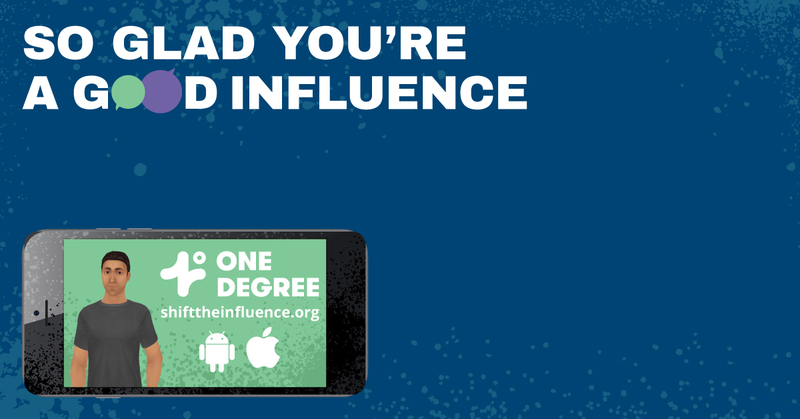 Download the One Degree: Shift the Influence to start the conversation today. 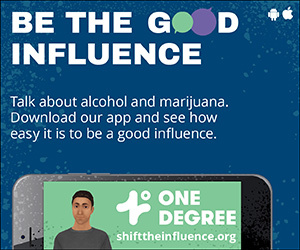 The One Degree: Shift the Influence app gives you to opportunity to practice talking with a virtual colleague and friend to learn important conversation skill that will help you navigate a positive conversation about alcohol and marijuana. Let’s transform the way we talk about alcohol and other drugs. A One Degree shift is all it takes. If you are a health care provider, click here to view our provider portal. Resources on how to talk to youth about marijuana use as well as information on use during pregnancy and breastfeeding. Compassionate care for mothers struggling with addiction. Resources on prevention, substance use, mental health, and recovery support. How you can get your care covered. Information on Parity, presented by The Kennedy Forum. Recognize violations of insurance rules. Provided by Peer Assistance Services, Inc.